An homage to Paul Scheerbart, brought to you by Josiah McElheny and friends. On Thursday, November 20, artist Jeff Preiss (director of the acclaimed film, in theaters now, Low Down) will be in conversation with Josiah. Famed Canadian filmmaker Guy Maddin will be live in-person on two nights: Saturday, November 22, he will be in conversation with renowned Walser translator Susan Bernofsky, and on Sunday the 23rd, he will play sound-loop interventions for silent film. This four-day celebration is inspired by the new book Glass! Love!! Perpetual Motion!!! A Paul Scheerbart Reader, coedited by Josiah McElheny and Christine Bugin and published this fall by University of Chicago Press and Christine Burgin. Curated by Josiah McElheny and Andrew Lampert with assistance from Bill Horrigan and Guy Maddin. November 20 7:30 PM Films about Glass! Including Light Club (2008), a film by Jeff Preiss and Josiah McElheny, plus a rare screening of a Jeff Preiss Standard 8 mm film and followed by a conversation with Preiss and McElheny. Friday November 21 7:15 PM Films about Love!! Including The Light Club of Vizcaya: A Women's Picture (2012), a film by Josiah McElheny, and following the early evening program of short films, a second feature (separate admission) about Scheerbartian Love, Alphaville: A Strange Adventure of Lemmy Caution(1965) by Jean-Luc Godard. 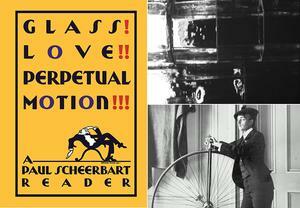 Saturday November 22 at 8 PM Films about Perpetual Motion!!! Including two films by Guy Maddin and followed by a conversation between Maddin and Susan Bernofosky, acclaimed translator of Walser, Kafka and Scheerbart. Inspired by the Em Gee Film Library, a program presented by Guy Maddin, in collaboration with Thomas Beard, Ed Halter, Andrew Lampert and Josiah McElheny. With "Live" Sound Loop accompaniment by Guy Maddin.